I recently wrote an article about the significant risk that cyclists have of becoming osteoporotic. While researching this, I found a large body of evidence showing that women who do endurance sports have a considerably higher risk of developing osteoporosis (#) than women who are sedentary and that this often occurs at a young age. Women who, in addition, take part primarily in non-weight-bearing endurance sports (cycling) are at an even higher risk than their male counterparts for developing osteoporosis. The potential for osteoporosis is so significant that this needs to be publicised. During the 1980s, researchers discovered that there was a high incidence of osteoporosis in young women athletes and that this was related to those women having irregular or absent menstrual periods (1, 2, 3, 4, 5, 6). Further research showed that the root cause of this was inadequate energy intake i.e. that the athletes were not eating enough to sustain optimal body function (7, 8, 9, 10, 11, 12, 13). This combination of osteoporosis, dysfunctional menstruation and energy imbalance is now known as the “female athletic triad” and is very well described (14). One of the most common manifestations of this condition in runners is the development of recurrent or persistent stress fractures (15). Any woman athlete presenting with a stress fracture should routinely have a bone density scan (€) to exclude osteoporosis. The female athletic triad is now known to be most prevalent in sports where leanness gives the athlete a competitive advantage (7, 13) i.e. cycling, running and triathlons. Athletes may consciously restrict their calorie intake to reduce body weight or the energy deficit may occur as a result of inadequate replacement of the calories lost with training. Whatever the reason for the reduced energy intake, the net result is the same: irregular or absent menses with resultant osteoporosis. Until quite recently it was not known how an energy imbalance could lead to dysfunctional menstruation. In 2010, however, a link was made to a hormone called leptin (16). This is a protein secreted by fat cells in direct proportion to the amount of body fat (16, 17). Leptin is released by fat cells into the blood stream and circulates to the brain where it has an influence on body functions (18, 19). 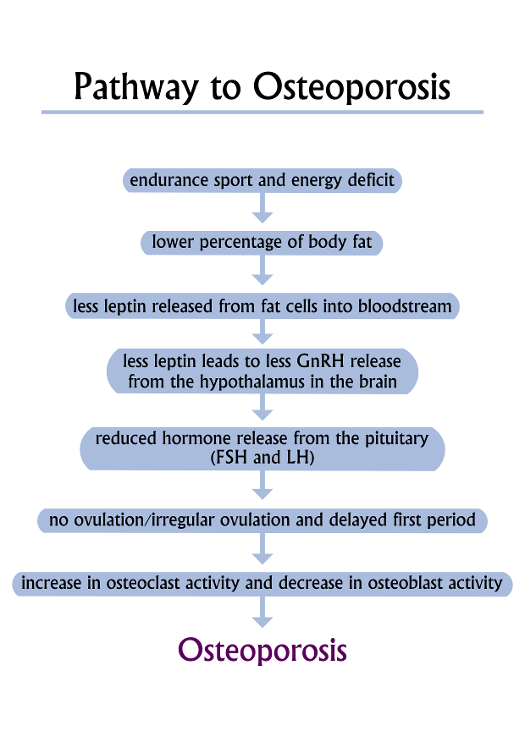 With calorie restriction, a woman athlete will reduce her fat stores with a resultant drop in leptin production. Once leptin levels drop below a critical point (which varies considerably between women (19)), this signals to the brain (in the hypothalamus) that energy stores are too low for a safe pregnancy (19). The brain then stops producing enough hormone (GnRH- Gonadotrophon Releasing Hormone) to stimulate ovulation (19, 20, 21, 22), and menstruation either stops altogether or becomes irregular. Dysfunctional menstruation leads to lower levels of oestrogen in the blood and this has a profound negative influence on bone health. Reduced oestrogen levels in women athletes leads to osteoporosis by influencing two important cells in bones: osteoclasts and osteoblasts (23). Osteoclasts are cells that break down bone to release calcium into the blood, while osteoblasts are there to rebuild the bone that has been lost. This process is usually in balance. With a lack of oestrogen, however, the balance is upset so that there is a net bone loss, leading to osteoporosis (23). The impact of this is greatest in teenage girls where a reduced oestrogen level at a time of life when bones are growing rapidly results in significantly thinner bones by the end of adolescence (3, 7, 23). If the lack of oestrogen continues into the twenties, osteoporosis quickly develops. So, just how prevalent is the female athlete triad and what percentage of female athletes develop osteoporosis as a consequence? Most of the studies have been done in women endurance runners. 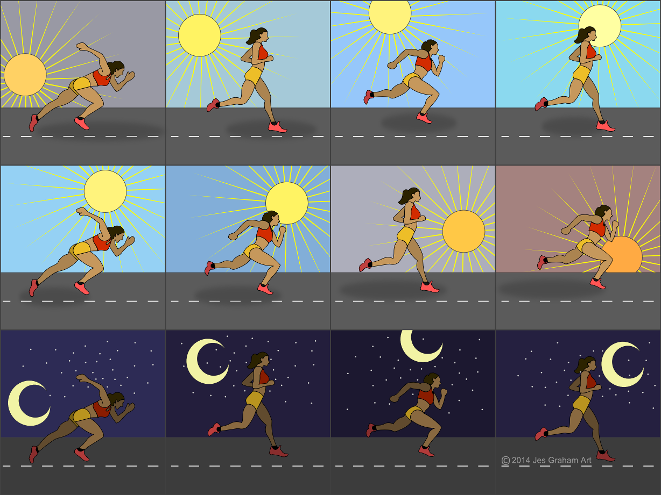 Studies have defined women endurance runners in different ways. Some have included any woman exercising more than 6 hours a week (12, 13), while others assessed women running more than 30km per week (7). What all studies found, however, was that the greater number of hours of exercise per week, the greater the likelihood of finding the triad and therefore osteoporosis. The one thing that really stands out in these studies is how young the women are. Average ages vary from 21 to 29 years (4, 5, 8, 9, 10, 12, 13). This becomes even more significant when one considers that between 34% and 53% of these women have been shown to have osteoporosis or osteopenia (¥) (4, 5, 9, 10, 12, 13). These statistics closely parallel the incidence of menstrual dysfunction which occurs in 35% to 66% of the athletes (4, 5, 7, 8, 9, 10, 12, 13, 20). One other significant fact stands out in a number of the studies: the part of the skeleton that is most affected by osteoporosis is the spine (9, 12, 13). This has serious implications for the athlete's quality of life in later years, so one needs to actively intervene as early as possible. The female triad is common and can result in significant health problems from a young age. The good news is that it is preventable, or reversible if detected early (24, 25, 26). This means that teenage girls and women doing endurance sports need to be aware of this condition so that they can monitor their menstrual cycle and use this as a barometer of energy balance. Regular menses are indicative of a good energy balance, while irregular or absent periods (need to exclude pregnancy, first) may well signify an insufficient calorie intake. An appointment with a gynaecologist should be made to exclude any other diagnoses. The mainstay of treatment is early detection and then a carefully measured increase in calorie consumption with a reduction in training hours, to the point that regular menstruation is regained (26, 27). Resumption of normal menstruation has been shown to be the most effective method for regaining bone density. Treatment includes optimising vitamin D levels and ensuring an adequate calcium intake. Managing this condition by giving oestrogen in the form of the contraceptive pill has not been successful (27). Rather, energy balance needs to be restored so that normal body physiology can be regained. Endurance exercise has many documented cardiovascular health benefits. In addition, women with normal menstrual cycles who take part in weight-bearing sports have been shown to have a superior bone density when compared with their sedentary friends (28). Osteoporosis only becomes a problem when women either participate in non-weight-bearing sports alone (cycling) or when a reduced calorie intake causes irregular menses and oestrogen deficiency. The combination of both (non-weight-bearing sport and an energy deficit) will have a profoundly negative impact on a woman’s bone health. Women and girls involved in endurance sports should all be educated about the female athlete triad. Knowledge about this condition will allow them to recognise the problem early and to make the necessary changes in diet and training to avoid the long-term problems associated with osteoporosis. From the Greek meaning “porous bones”. It is a bone disease where bones have lost protein and calcium, resulting in weaker, less dense bones that are more prone to fractures. Defined by the World Health Organization (WHO) as a bone mineral density of 2.5 standard deviations or more below the mean peak bone mass (average of young, healthy adults) as measured by dual-energy X-ray absorptiometry. Bone density scanning, also called dual-energy x-ray absorptiometry (DXA) or bone densitometry, uses an enhanced form of x-rays to measure bone density. Standard sites in the body (lower spine and hips) are scanned and the results are compared with the average for young, healthy adults. It is completely painless and takes about 15 minutes to do. Costs vary between R1350 and R1600, as of 2014. Most comprehensive medical aids will cover the cost. Occurs where there is thinning of bones but where this is not yet bad enough to be called osteoporosis. Significant numbers of people with osteopenia will progress to osteoporosis without treatment. More specifically, osteopenia is defined as a bone mineral density of 1 to 2.5 standard deviations below the mean peak bone mass as measured by dual-energy X-ray absorptiometry. Linnell SL, Stager JM, Blue PW, Oyster N, Robertshaw D. Bone mineral content and menstrual regularity in female runners. Med Sci Sports Exerc. 1984 Aug;16(4):343-8. Cann CE, Martin MC, Genant HK, Jaffe RB. Decreased spinal mineral content in amenorrheic women. JAMA. 1984 Feb 3;251(5):626-9. Rutherford OM. Spine and total body bone mineral density in amenorrheic endurance athletes. J Appl Physiol (1985). 1993 Jun;74(6):2904-8. Nelson ME, Fisher EC, Catsos PD, Meredith CN, Turksoy RN, Evans WJ. Diet and bone status in amenorrheic runners. Am J Clin Nutr. 1986 Jun;43(6):910-6. Cook SD, Harding AF, Thomas KA, Morgan EL, Schnurpfeil KM, Haddad RJ Jr. Trabecular bone density and menstrual function in women runners. Am J Sports Med. 1987 Sep-Oct;15(5):503-7. Maugars Y, Lalande S, Berthelot JM, Potiron-Josse M, Charlier C, Prost A. Sports, bones and hormones. Multiple interactions. Presse Med. 1995 Sep 30;24(28):1284-6. Cobb KL, Bachrach LK, Greendale G, Marcus R, Neer RM, Nieves J, Sowers MF, Brown BW Jr, Gopalakrishnan G, Luetters C, Tanner HK, Ward B, Kelsey JL. Disordered eating, menstrual irregularity, and bone mineral density in female runners. Med Sci Sports Exerc. 2003 May;35(5):711-9. Gibson JH, Mitchell A, Harries MG, Reeve J. Nutritional and exercise-related determinants of bone density in elite female runners. Osteoporos Int. 2004 Aug;15(8):611-8. Epub 2004 Mar 26. Barrack MT, Rauh MJ, Barkai HS, Nichols JF. Dietary restraint and low bone mass in female adolescent endurance runners. Am J Clin Nutr. 2008 Jan;87(1):36-43. Pollock N, Grogan C, Perry M, Pedlar C, Cooke K, Morrissey D, Dimitriou L. Bone-mineral density and other features of the female athlete triad in elite endurance runners: a longitudinal and cross-sectional observational study. Int J Sport Nutr Exerc Metab. 2010 Oct;20(5):418-26. Yeager KK, Agostini R, Nattiv A, Drinkwater B. The female athlete triad: disordered eating, amenorrhea, osteoporosis. Med Sci Sports Exerc. 1993 Jul;25(7):775-7. Barrack MT, Gibbs JC, De Souza MJ, Williams NI, Nichols JF, Rauh MJ, Nattiv A. Higher incidence of bone stress injuries with increasing female athlete triad-related risk factors: a prospective multisite study of exercising girls and women. Am J Sports Med. 2014 Apr;42(4):949-58. Ackerman KE, Slusarz K, Guereca G, Pierce L, Slattery M, Mendes N, Herzog DB, Misra M. Higher ghrelin and lower leptin secretion are associated with lower LH secretion in young amenorrheic athletes compared with eumenorrheic athletes and controls. Am J Physiol Endocrinol Metab. 2012 Apr 1;302(7):E800-6. Khan SM, Hamnvik OP, Brinkoetter M, Mantzoros CS. Leptin as a modulator of neuroendocrine function in humans. Yonsei Med J. 2012 Jul 1;53(4):671-9. Hirschberg AL, Hagenfeldt K. Athletic amenorrhea and its consequences. Hard physical training at an early age can cause serious bone damage. Lakartidningen. 1998 Dec 9;95(50):5765-70. Warren MP, Perlroth NE. The effects of intense exercise on the female reproductive system. J Endocrinol. 2001 Jul;170(1):3-11. Frisch RE. Body fat, menarche, fitness and fertility. Hum Reprod. 1987 Aug;2(6):521-33. Li D1, Hitchcock CL, Barr SI, Yu T, Prior JC. Negative spinal bone mineral density changes and subclinical ovulatory disturbances--prospective data in healthy premenopausal women with regular menstrual cycles. Epidemiol Rev. 2014;36(1):137-47. Drinkwater BL, Nilson K, Ott S, Chesnut CH 3rd. Bone mineral density after resumption of menses in amenorrheic athletes. JAMA. 1986 Jul 18;256(3):380-2. Lagowska K, Kapczuk K, Friebe Z2, Bajerska J. Effects of dietary intervention in young female athletes with menstrual disorders. J Int Soc Sports Nutr. 2014 May 26;11:21. Madsen KL, Adams WC, Van Loan MD. Effects of physical activity, body weight and composition, and muscular strength on bone density in young women. Med Sci Sports Exerc. 1998 Jan;30(1):114-20.